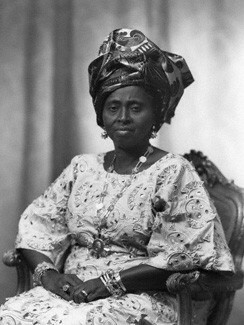 President Muhammadu Buhari has received with immense sadness, news of the passing away of Chief (Mrs.) Hannah Dideolu Awolowo. On behalf of the Federal Government and people of Nigeria, President Buhari extends sincere commiserations to the children, grand children and great grand children of the “Jewel of Inestimable Value” on the death of their famed matriarch, just a few weeks before her hundredth birthday. The President joins them and millions of admirers of her late, revered husband, Chief Obafemi Awolowo in mourning Chief (Mrs.) Awolowo who will be long remembered and celebrated as the famous spouse and pillar of strength of the late nationalist, political leader and sage. President Buhari believes that Chief (Mrs.) Awolowo will always be honoured too for the indelible legacy of very significant, behind-the-scene contributions to communal, state, regional and national development which she has left behind. The President prays that God will comfort Chief (Mrs.) Awolowo’s family, relatives, friends, associates and admirers, and grant them the fortitude to bear her irreparable loss. He also prays that the Almighty will receive the late matriarch’s worthy soul and grant her eternal rest from her long, earthly service to her renowned spouse, family, community and country.